It’s not been a vintage year for Dabrowski and her Chinese partner Yifan (Julie) Xu. Still, they’re tied at No. 15 in the WTA Tour doubles rankings. They made the semifinals at Indian Wells and the quarters in Miami. Both times, they lost to the Sunshine Double(s) champs, Elise Mertens and Aryna Sabalenka. Xu has been dealing with some injuries, mainly her back. So you hope that by the time the busy spring and summer season roll around, they’ll be back to full strength. She earned three of her eight career WTA Tour titles in 2018 (two with Xu, and one with Jelena Ostapenko). Dabrowski also claims three mixed doubles titles: the 2018 Australian Open and Roland Garros with Mate Pavic of Croatia, and the 2017 French Open with Rohan Bopanna. Dabrowski’s next event will likely put her over the $2 million mark in career earnings. Which is a nice number for a player who makes her living playing women’s doubles. But that success has forced her to all but abandon her singles career. It’s a first-world problem to have. But Dabrowski was and is a fine singles player. If you’ve watched her Fed Cup teammate Bianca Andreescu over the last month, you get a sense of what she can do on the singles court. The only thing missing might be a little putaway power from the baseline. But that’s more a matter of confidence than ability. The new ITF Tour has made it all but impossible for her to try to squeeze in some singles, with her current ranking of No. 401. She actually has more opportunities filling empty spots in the qualifying at the WTA events she plays. But she’s at it this week, at a $80K ITF tournament in Palm Harbor, Fla.
As a junior, Dabrowski won the Orange Bowl in 2009, beating Kristina Mladenovic in the final. She reached the doubles final a month later at the Australian Open juniors with Timea Babos. There aren’t many players who have won the Les Petits As event and the Orange Bowl. But Dabrowski was one of them. She came along perhaps a little too early for the much-vaunted Tennis Canada high-performance program to help her. Were she to do those sorts of things these days, the help and support would have been off the charts (under certain conditions, of course). On the personal side, Dabrowski is bright, insightful and refreshingly aware of the world outside her personal tennis bubble. In her mid-20s, she’s coming into her own as a person, not only a tennis player. The former WTA Tour player is now best known as the longtime significant other, wife and mother of Roger Federer’s four children. Federer constantly credits her as a big reason he’s still playing. If Mrs. Federer wasn’t on board with it – and all the logistics involved with four kids in making it happen – he wouldn’t be here. Her most impressive moment was at the 2014 Indian Wells final. There she was, sitting in the stands, quite pregnant with twins, during an overbearingly hot day. It was a stellar show of support. Less than two months later, Leo and Lenny were born. Born in Slovakia, Vavrinec got to No. 76 in singles on the WTA Tour on Sept. 10, 2001 (Think about that day … the day before …). She reached the third round of the U.S. Open that year. Vavrinec lost in the first round of her last six tournaments through the end of 2001 and the beginning of 2002, and called it quits. Of course, by then, she and the Fed were already a thing. But she OWNED Rita Kuti Kis of Hungary (on the honour roll for best tennis name ever). Her most high-profile moment on the court was probably playing Hopman Cup down in Perth with her gentleman friend. The two looked like crazy kids in love. But Mirka could hardly play, she looked so uptight. No kidding. Meanwhile, at 41, she looks better than ever. We want the name of her facialist. The third, youngest (and perhaps best) of the three Bulgarian tennis-playing sisters hits double-fours. Known as Maggie, the baby sister reached No. 4 in singles (Jan. 1996) and No. 13 in doubles (Feb. 2004) during a long career that had her playing in Grand Slam events every year between 1990 and 2005. Her career best was a quarter-final at the 1992 U.S. Open; but the reached the round-of-16 at majors 14 other times. Her longevity was all the more amazing considering she turned pro on her 14th birthday. She won 10 singles titles in all. Maleeva’s last match had been in Oct. 2005 in Zurich, where she lost to Patty Schnyder after crushing Anna Chakvetadze in the first round. The Maleeva sisters: Katerina, Manuela and Magdalena. 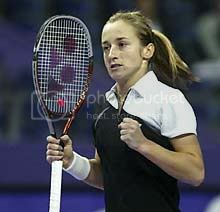 But then, out of nowhere, she reappeared eight years ago, playing doubles for Bulgaria in the zonal playoffs in Fed Cup. She and partner Dia Evtimova won all three of their matches in the round-robin without dropping a set. And that included a 6-1, 6-3 win against the very good Polish pair of Jans and Rosolska. These days, she’s big on causes, both political and environmental, in her native Bulgaria. Every once in awhile, you see her at the legends’ events. MIAMI GARDENS, Fla. – Most often, in the leadup to big tournaments when the bigger stars are practicing on the stadium court, they do so in near-anonymity. The stadiums are closed to the public. And they’re often closed in general. At Indian Wells, the players have to access the Stadium 1 court through the stands, climbing back up to exit once they’re done. But on Monday at the Miami Open, with the qualifying going on outside on the smaller courts, the tournament announced over the public-address system that anyone could come in and see Roger Federer practice on the main stadium at 6 p.m. There were already fans in place in the cushy recliners that line the big court. They were joined by some additional happy Federer fans. (We were told that the privilege of watching the best players practice in those pre-tournament days is part of the VIP luxury packages. Those include those comfy seats – plus tables for their Moët et Chandon, and plugs for all their devices). Federer played the Indian Wells final late Sunday afternoon against Dominic Thiem, losing in three tough sets. Barely 24 hours later, he was on the court in Miami. It takes some time getting adjusted to the challengers you incur making transition from the desert to the tropical Miami humidity. So the early the better. Here’s some video of it. Practicing with Federer was the Hungarian Marton Fucsovics, who is playing the best tennis of his career at age 27, and is currently ranked No. 36. That means Fucsovics is seeded No. 29 in Miami. It’s his third time playing the Sunshine Double, which has 96-player draws. Fucsovics played other Masters 1000 events (with smaller draws, thus with a more stringent cutoff) for the first time in 2018. It was interesting to see them exchange crosscourt groundies and be pretty even-steven. Just another reminder that the difference between the champions and the contenders primarily isn’t how they well hit the ball. But when the two would sit down for a water break, Fucsovics needed to wipe off the perspiration coming down his face and neck. Federer looked like he didn’t even break a sweat. INDIAN WELLS, Calif. – If you’re going to come into a press conference and ask Roger Federer the gazillionth question of his long, trilingual media career, you’d best have your ducks in a row. Otherwise, the Swiss star is going to drop a couple of well-deserved barbs on you. The poor fellow in question came into Federer’s post-match press conference after his straight-sets win over Stan Wawrinka with a whole narrative prepared. Would Federer try to add another Davis Cup to his resumé, given the shortened format and the resultant lack of a multi-week commitment throughout the year? (We’ll grant him that this, at its core, was supposed to be the point of the sweeping Davis Cup changes). Federer didn’t play the qualifier in February. And without him, Switzerland was beaten by a solid, young Russian team that included Karen Khachanov, Daniil Medvedev and Andrey Rublev. And so, Fed had a bit of a go. Here’s the other element of this tale, which Federer didn’t offer up in his explanation. Had he wanted to play the Davis Cup finale in Madrid in November (along with his compatriot Stan Wawrinka), he well could have. The organizers had two wild cards to give away. And, for whatever reason, they announced those all the way back last September. Great Britain and Argentina were the big winners. Obviously, since then, No. 1 Brit Andy Murray has had hip surgery. And No. 1 Argentine Juan Martin del Potro fractured his kneecap. But more than that, Federer says they put the full-court press on him for a quick decision. Not only did the three-day deadline not give him enough time to “consult with all the people he had to consult“, he also didn’t appreciate the modus operandi. Had those two wanted to play in November, you have to think that would have been a done deal. You have to feel bad for the guy – his heart was true. But this was a fairly big deal at the time. It’s not as though it required extensive dark ‘net research to unearth or anything. He could have asked anyone of at least a dozen people in the press centre, too, before he dove into the Fed-abyss. INDIAN WELLS, Calif. – Roger Federer came almost directly to Indian Wells from Dubai, arriving during the daytime Monday. He hit the courts shortly afterwards and on Wednesday, pronounced himself almost back on schedule, jet-lag wise. With the first-round bye (he’ll play the winner of Peter Gojowczyk and Andreas Seppi), he won’t have to play until the weekend. And as he came in to do his media availability Wednesday afternoon, he touched on various subjects. One that he didn’t particularly want to talk about was the looming decision by the ATP Tour players on CEO Chris Kermode’s future. But he went into various other areas. Federer on retirement, and what it will look like. INDIAN WELLS, Calif. – He might still be a little jet-lagged, but Roger Federer looked just fine on Stadium 1 Wednesday. The No. 4 seed at this week’s BNP Paribas Open practiced with Pablo Carreño Busta of Spain in the early evening. Meanwhile, at the other end of the Indian Wells site on Stadium 2, eight other male players were about to wait out a rain delay before playing the Tie Break Tens event. By the time they were done, Federer probably had his feet up at his house watching. Milos Raonic beat Stan Wawrinka in the final to pick up the $150,000, winner-take-all purse. Federer made the long trip from Dubai, where amid much fanfare he sealed his 100th career ATP Tour title. He moved his ranking up from No. 7 to No. 4 with the win, and that gives him the No. 4 seed. He was drawn in the same half as Rafael Nadal. His early draw looks pretty good. After a first-round bye, he’ll play against the winner of Peter Gojowczyk (1-0) and Andreas Seppi (14-1 during their long careers). If he wins that, he likely would face his longtime friend Stan Wawrinka. Despite the fact that he’s starting to play some good tennis, Wawrinka remains unseeded at this event. But the seed he would face in the second round is No. 29 Marton Fucsovics of Hungary. Kyle Edmund, Frances Tiafoe and Fabio Fognini are in the section from which their next opponent would spring. Here are some photos of the session. It turns out Roger Federer wasn’t kidding about rejoining clay-court civilization in 2019. The Mutua Madrid Open confirmed Wednesday that the 37-year-old Swiss will play the Masters 1000 tournament, which will take place May 3-12. The end of Madrid comes two weeks before the start of this year’s French Open, which Federer also is expected to play. From the positioning of it, it appears it might be the only tuneup the 2009 champion will take part in before the big event – unless someone else comes through with a nice offer between Monte Carlo and/or Barcelona. Federer returns after skipping the clay-court season entirely the last two years. In 2018, Federer had a three-month block between Miami and the grass-court tournament in Stuttgart in which he didn’t play. Same in 2017. In 2016, he played Monte Carlo and Rome – but withdrew from the French Open. Combine the effects of knee surgery, a virus and a wonky back, and Federer decided he wan’t fit enough. In fact, after Wimbledon, he didn’t play the rest of the season – only to come back stronger than ever in 2017. So when he arrives in Paris, will be the first time in four years he wasn’t in the city in the springtime. It snapped a streak of 65 consecutive Grand Slams played. Federer showed up in Madrid in 2016 – only to announce he was pulling out because of his back issues. He missed the French Open that year, and hasn’t been back to Paris since. Until this year. When Federer announced at the Australian Open – right after his loss to Stefanos Tsitsipas – that would indeed get his sneakers grimy this year, most speculation settled upon Barcelona and perhaps Rome as likely destinations. No doubt the bidding began apace. One of Federer’s contemporaries, Feliciano Lopez, is the new tournament director this year after serving as an apprentice to Manolo Santana in 2018. So that’s a pretty great initial feather in his cap. Meanwhile, Federer is due to return to action next week in Dubai, his first tournament since Melbourne. Remember the blue Madrid clay in 2012? Federer sure does. That was quite an … episode in clay-court history. If we know anything, it’s that for Madrid tournament owner Ion Tiriac, money is no object. Even if his event is a Masters 1000 tournament and therefore mandatory for all the players without the exemption service time of Federer, Novak Djokovic and Rafael Nadal, there can always be more fans. At a little bit of altitude, Madrid plays more quickly than some of the other clay-court events – something home-country hero Nadal doesn’t much care for, but which Federer doesn’t mind. He won the event in 2006, 2009 and 2012, and reached the final on two other occasions. That 2012 edition was … special. Federer was basically the only player in the field who actually liked Tiriac’s one-year flirtation with blue clay that turned out to be significantly more slippery that anticipated. The last time Federer played Madrid, in 2015, he was beaten in his opening match by a young Nick Kyrgios by a crazy score: 6-7 (2), 7-6 (5), 7-6 (12). It was their first-ever meeting.